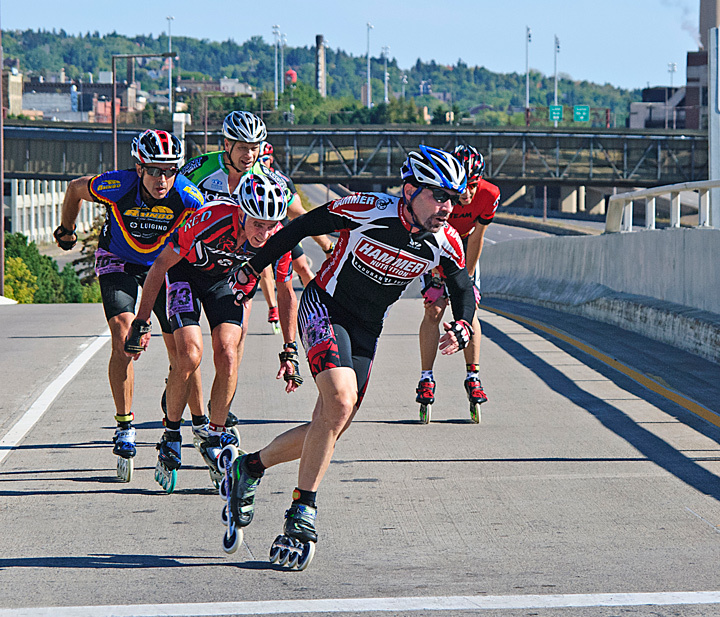 The Northshore Inline Marathon is the largest marathon of its type in North America although inline skating seems to be on the decline it is still a large event with folks coming from all over the world to participate. It starts in Two Harbors, Minnesota and ends in Duluth, Minnesota. The route is along the beautiful north shore of Lake Superior. Even though I had gone down to watch the elite racers finish I had gotten distracted by a large ship leaving the harbor. Before I knew it the elite skaters were almost past me. The race also attracts rollerskiers. Skaters heading into the final turn of the race. The race attracts all ages. This young woman was near the front of the pack. 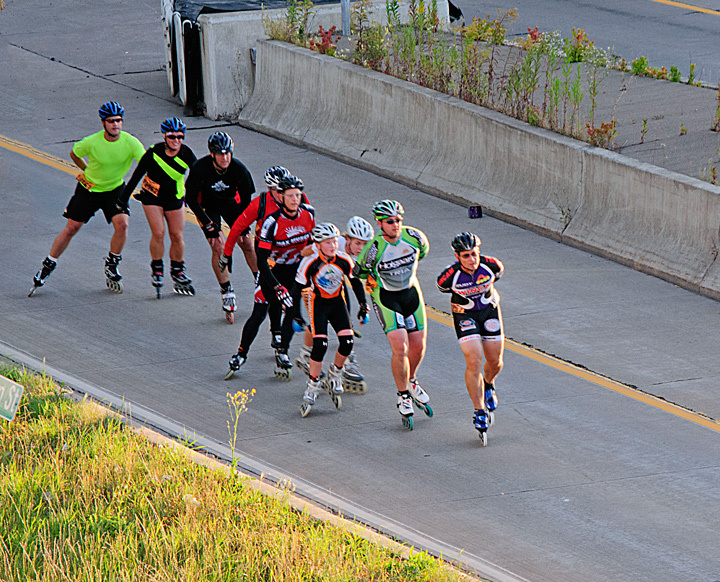 Skaters have to climb a steep hill near the end of the race. At the top of the hill they then head down a steep hill. More than a few racers had problem navigating this hill. There were some weak ankles by the end of the race. This is what my ankles would look like at the start of the race. 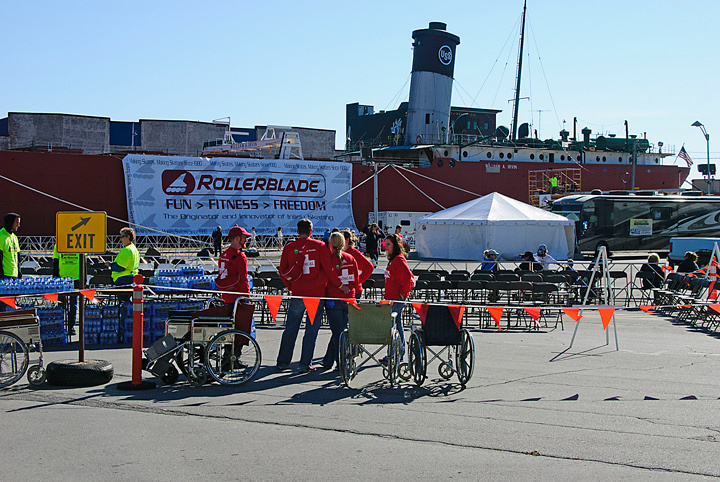 We happened to be in Duluth last weekend when the 19th NorthShore Inline Marathon took place. 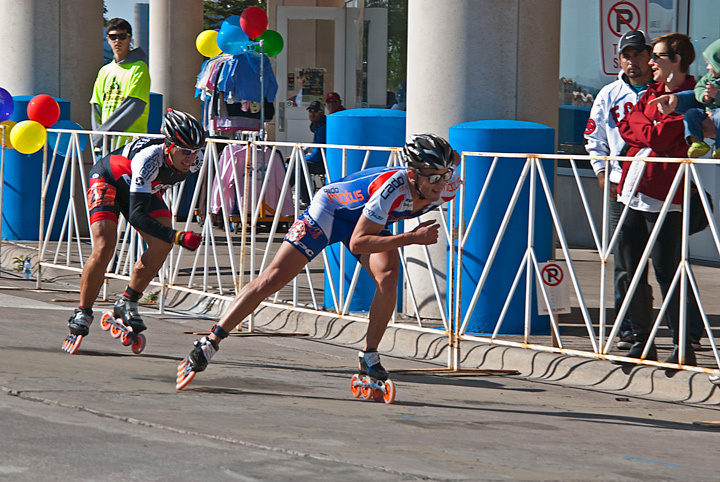 The race not only had opportunities for inline skaters but also included runners and ski skaters. We watched from various locations in downtown Duluth and the waterfront. Some skaters were not as serious and the elite skaters and were dressed in all manner of costumes. 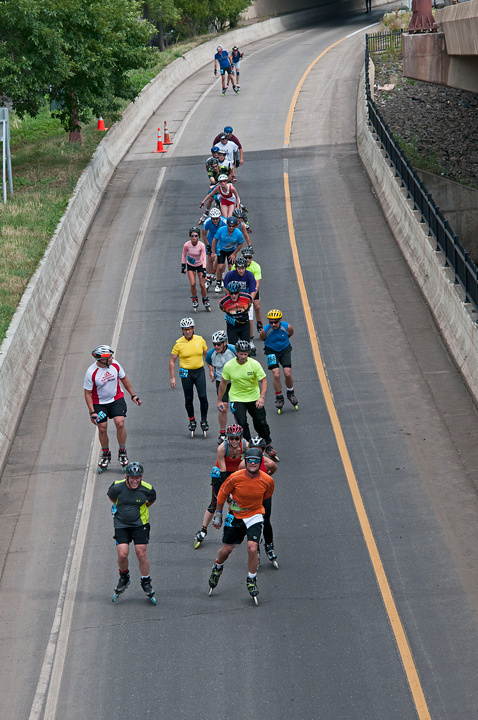 More photos from the NorthShore Inline Marathon can be found on my website. This probably falls under the better late than never category. 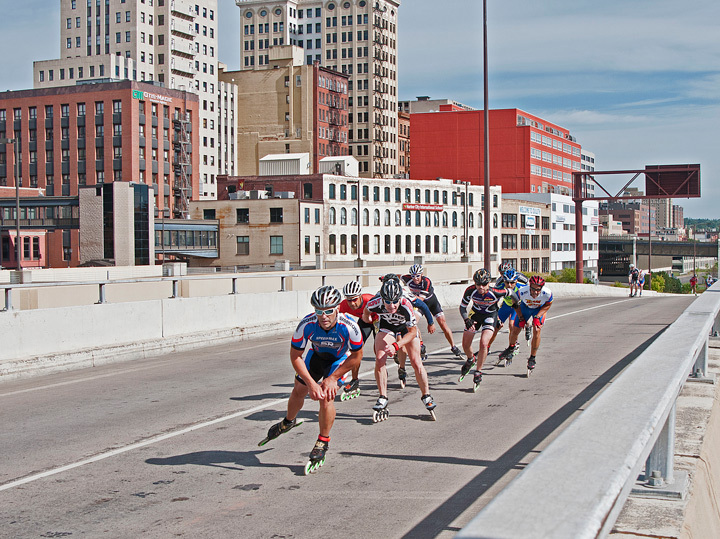 About a month ago we were in Duluth when the NorthShore Inline Marathon was taking place. We had gone down to Canal Park to photograph the sunrise but there wasn’t much of a sunrise. We wandered over to where the Irwin is docked, finish line for the race, to see what was going on. there wasn’t much happening but they we getting ready for the first of the half marathon racers to finish. We headed back to our condo to grab a bite to eat before the main race group was scheduled to finish. I was out on the balcony drinking morning coffee when the first of the half marathon racers started coming by. 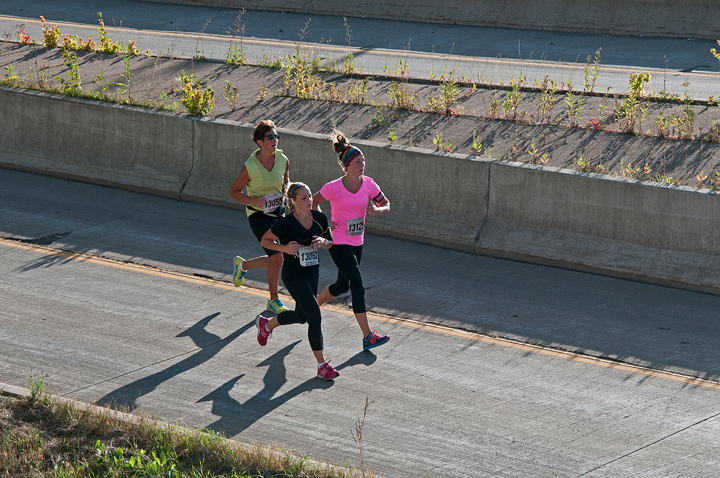 I managed a few photos of them because the course ran on the road below the condo. After watching them for a while we headed out to get to the finish area before the racers from the full marathon started to finish. We arrived near the finish area with a few minutes to spare. 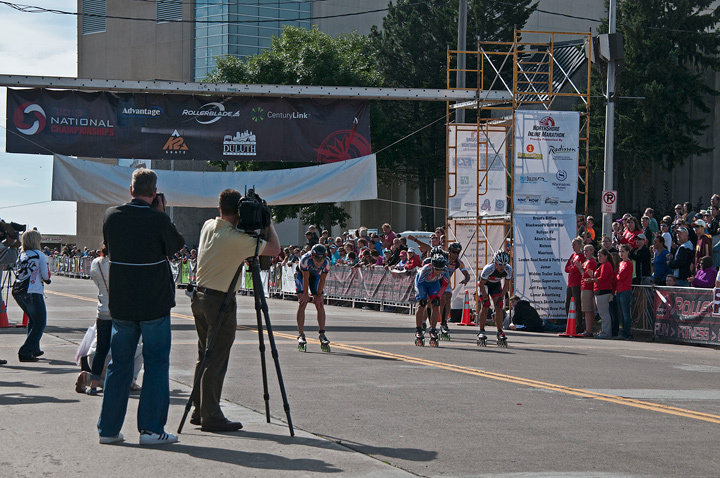 I took a few photos of the finish area and then picked a good spot about a hundred yards from the finish line. I was surprised there weren’t more people around but I suppose there are plenty of places to watch a 26 mile race. Soon some motor cycles and police cars came along the road with the first two racers neck and neck. It was almost a photo finish with Wesley Gandy from Virginia finishing less than a second ahead of Mejia from Columbia. 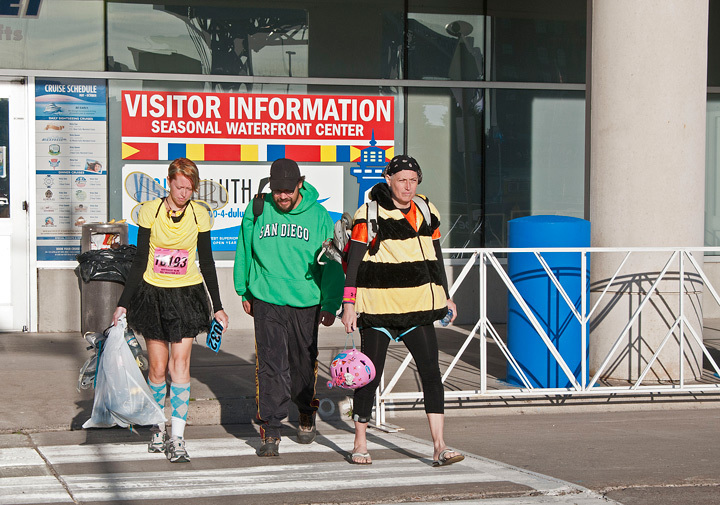 We then walked back down the race course to take a few more photos of the later racers finishing. This was take on the exit ramp from south fifth avenue. The racers were coming up the ramp. When we returned to the condo the race was still underway and I had a little more coffee and watched some of the later racers finish.